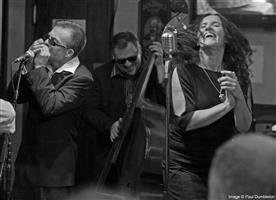 Scottish five-piece Swing / Rhythm & Blues / Jazz band. Each member brings with them a broad spectrum of musical influence, which combines perfectly in their exciting and varied sets. Baby Isaac play a mix of original material and cover versions, breathing new life into original Blues classics, whilst bringing new, expertly crafted compositions to audiences, both young and old. Whether you get your kicks from blinding Blues guitar work, incredibly dynamic vocals, stunning harp playing or a swinging rhythm section, Baby Isaac have all of the above, so make sure you don’t miss the opportunity to catch one of the UK’s finest.